Why it matters: Vizio's streaming TV service is yet another way the TV maker can differentiate itself from the growing number of manufacturers catering to budget buyers. It's probably not going to sway most purchasing decisions either way but if you're already planning on picking up a Vizio set (or currently own one), there's no harm in checking it out. Consumer electronics maker Vizio on Wednesday launched WatchFree, a new streaming service designed with cord-cutters in mind. 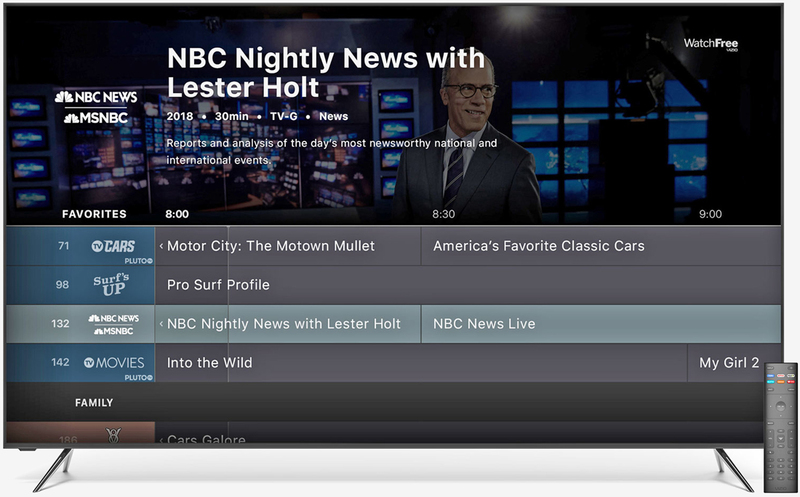 Available now on nearly all Vizio SmartCast TVs, the new service, in partnership with Pluto TV, offers streaming access to more than 100 live and linear channels featuring news, movies, sports, TV shows, viral videos, concerts and more – all for free. According to Vizio, it has all of the attributes associated with traditional cable TV without the antennas, cable boxes, cords and cost. Of course, the big difference between a traditional cable package, a paid over-the-top streaming service or even free over-the-air networks is the quality of channel selection. Vizio’s new service offers access to channels like Pluto TV Movies, Black Cinema, News 24/7, Action Movies, NBC News / MSNBC, Frontdoor, Fox Sports, Cats 24/7, MST3K, Crime Network and The Surf Channel, just to name a few. Needless to say, it’s not the same caliber of content you’d get from a paid service like Sling TV. Then again, it's free, so there's that. Pluto TV is also available for free on the web and on more than a dozen platforms including Roku, Apple TV and Amazon Fire TV.